You know it! Whenever I’m in a maxi skirt, I twirl and sway like there’s no tomorrow. It’s my money shot. LOL. I’m so glad I found this maxi skirt when I went to Malaysia last year because it’s always so hard to find maxi skirts that are long enough to wear heels with. If you want flowy skirts that won’t make your tummy seem big, instead of shirred skirts, go for pleated ones like this. Pleats are flat so they won’t make you lose your waist. I paired my skirt with this beautiful top from Stylista. I love how dramatic my top looks. It’s actually jersey and leather combined. Too bad you can’t see it clearly here. 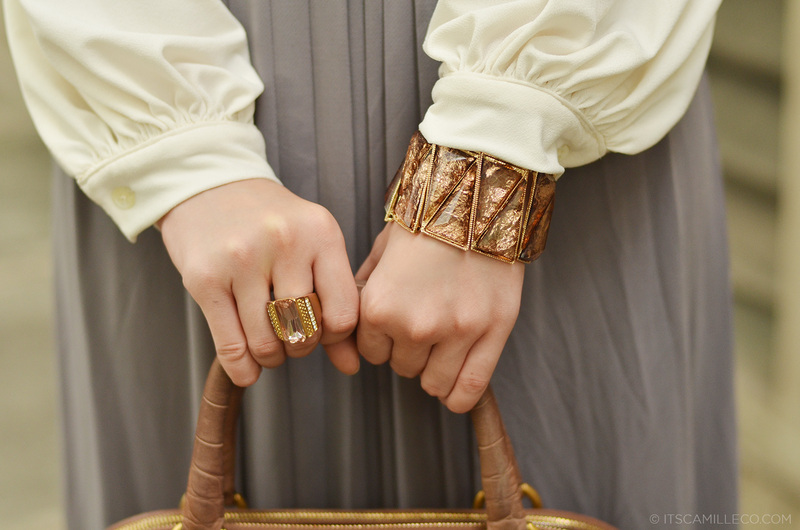 To add a little warmth to my look, I wore accessories in shades of rose. It’s a nice way to balance out the cool tones. They’re so comfy! Thanks Marichelle! Seriously love your bags. I mean, ugh, I don’t even. I just love them. And I think this is one of my favorite looks from you. HOLY WOW Camille! I love this outfit! As in the whole outfit! Hi Camille. Why do you always look fabulous? Hehe. I just wanted to ask for your opinion, im thinking of wearing a blue maxie dress paired with a red blazer? Would that be fine? I mean i want to know it from a doll’s point of view. Thank u so much!! Kisses! Good day Ms. Camille! I was wondering if a chubby and not-so-tall girl like me could also wear maxi skirts? Will it suit me or not? I’ll be waiting for your expert opinion. Much love! I have this kind of top, but I never have confidence to wear it. But you made it, Camille! Thanks! It just takes me some time to approve and go through the comments :) Lately, none naman :) Knock on wood! Hahahhaa! :) You made me laugh so hard! I’m going to Manila soon for a trip, and I really want to visit the SM Mall of Asia you talk so much about. Since I don’t have a lot of time there, I was wondering if you could give me a few pointers about which shops I MUST go to. I know the bigs ones, like Mango, TopShop, F21, but what about some of the more native shops? Fashion, food, anything is welcome!! Thank you sooo much. Haha! Donyang-donya na, richie rich pa? LOL :) Thanks MK! you have beautiful maxi skirt madame Camille :) and those bag :) love it! Modern interpretation of the Maria Clara dress back in the Spanish Era! Lovely!!! Question… Did you watch the premiere of The Carrie Diaries? Did you like it? Awww thanks Jane! Work calls! lakas makatangkad ng maxi skirts! The maxi dress is so pretty. I like the colour of it too! me: Andito na naman FUSHIA, si Miss Camille, with her maxi skirt…Hindi na isang balde lang ng pampatangkad ang iinumin ko. isang drum na talaga! HAHAHA :) So funny! Thanks Gladys! parang sobrang sosyal pag may big floppy hat ka pa dito! :3 this is SO pretty and fabulous nonetheless! I love it when you wear flowy skirts/dresses! I can understand the twirling feeling you have when wearing them too! This outfit is a big bag of awesome! 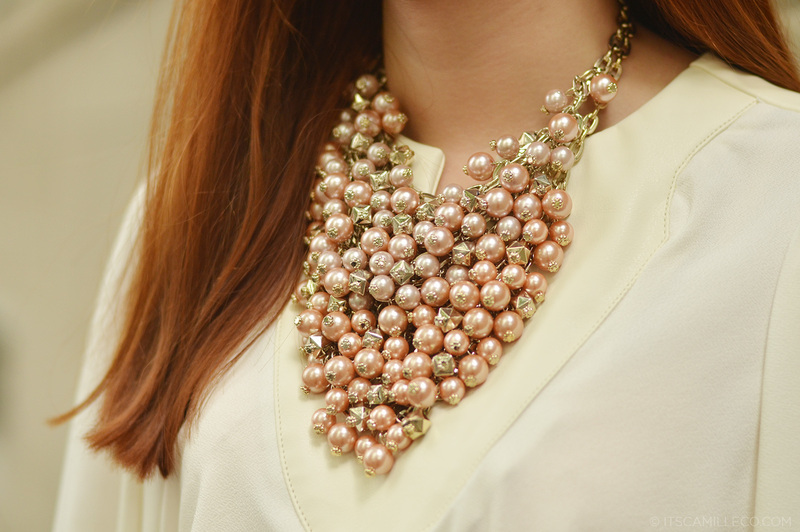 I love the rose color of the pearl necklaces as well as the blue-grey shade of the maxi skirt. I really love the color palette of this outfit, I really do! Such a gorgeous styling! Eventhough I am a man, I am very much in love with that YSL’s bag! Ah!! Jelous* haha! It’s nice to meet you, Donya Camille. Haha. Ang yaman at ang matured ng dating! Hahaha :) Nice to meet you too! I remember almost tripping LOL :) Thanks Lydia! why so maganda?? hahaha….i love you ate camille…..ang ganda mo and i love your style same to ate laureen…. You looked really taller when you wore that maxi skirt and syempre, pretty parin. Hihi. :)) Anyway, I’m a 13 year old girl and I want to have my legs and underarms waxed but Lay Bare, Strip, and other waxing salons won’t let me undergo the process. I also want to lose my upper lip hair or femstache. Can you suggest any product that I could use that isn’t that painful so that I could wax/remove the hair by myself? Thanks! Shucks I’m not sure since I don’t use any at home :( Sorry! Where do you go to for waxing? so pretty ! love your skirt ! Ang lakag makadonya ng outfit, ‘te! Ang gandaaaa!! :) Sana I could have guts to wear the same thing. Hehe! Feeling ko kasi hindi bagay sa skinny like me kasi whenever I try wearing loose, sinasabihan akong “mukha kang hanger” LOL! Any suggestion? :) Thanks! You look lovely here :D So nice:! Never tried my hand with maxi skirts but after seeing this outfit I think, I should add it to my wardrobe. It has the right amount of girliness and sophistication perfect for those casual and conservative meetings. You look lovely! Thanks Christine! Maxi skirts are so comfy! I love the Victorian vibe of the top! I love the whole ensemble but if you will allow me a request, I would love to see you wear this top again with a laced bib necklace — it will be a super Oh Em Gee moment for me! Do you have a shop for your designs Ms. Camille? I like! SM accessories is the place to be when it comes to accessory shopping! Love those pieces on you! Very Boho Chic ang look na ‘to! Your bag looks mature din! At mukhang x10 ang pagiging mamahalin kasi I can see crocodile leather! LAVET! wow.. amazing.. do u often go to gym? WOWOW! awesome look! love this! IM THE FIRST ONE TO COMMENT again hooray !! you look so beautiful :D !! You never fail to look elegant Camille! I looove this Old England look! very classy and elegant nitoo! such a romantic look! love it! Love your flowy skirt and purse! !